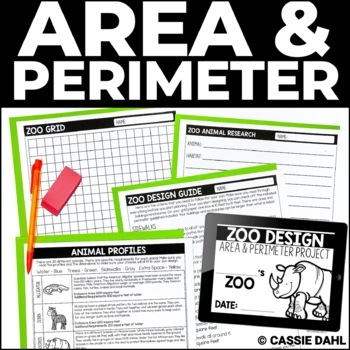 How boring are your assessments? Guess what... they don't have to be anymore. 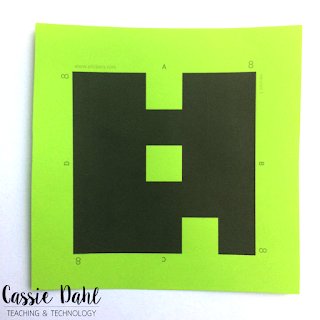 Plickers is a free assessment tool that is uses the concept of students responding with a clicker... except- there are no clickers! 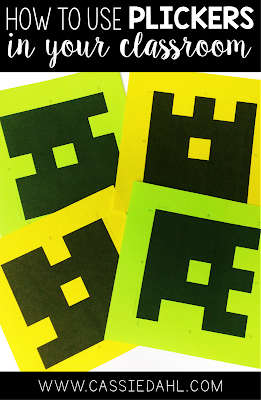 Instead, students use a paper clicker (plicker) which is similar to a QR code. The website, app and cards are free- so you don't want to miss out on this! Oh, and trust me. 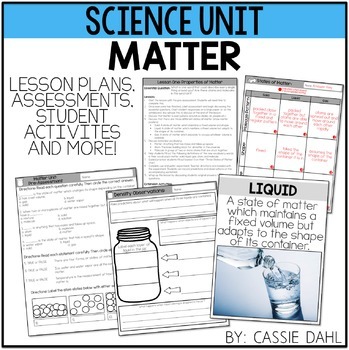 Your students will love it! First the cards. 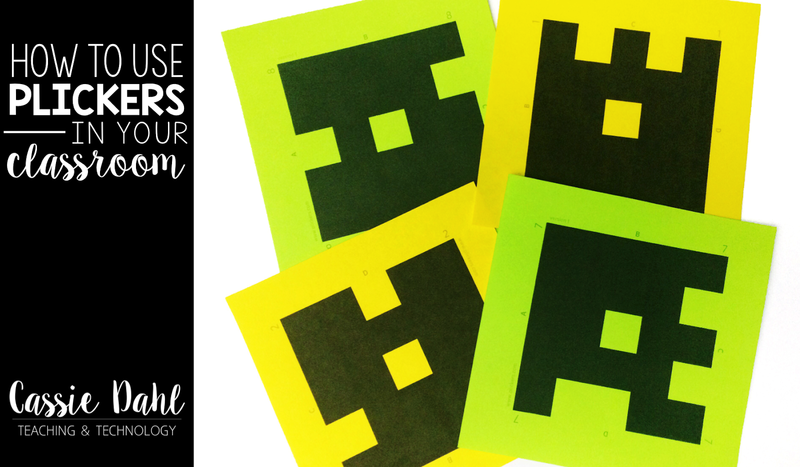 They are a free download that you can get off of the Plickers website here. There are a few different options you have for printing including larger cards for our littlest learners. 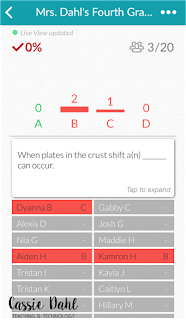 Each card is labeled with a specific number and this number will correlate to a specific student. You can easily use the same card with multiple classes if you are not self-contained. 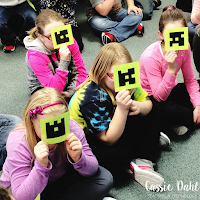 You will just need to create different classes on the Plickers website and then assign the card numbers so no two students have the same card in the same class period. Let's take a closer look at the card. With the case of the card with the clothespin, the scanned answer would be C. It is seriously that easy! 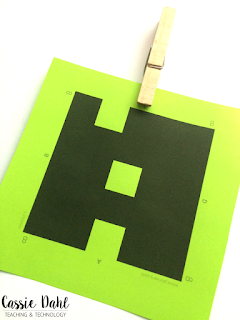 Plickers recommends printing the cards on white paper so that the codes scan easily. 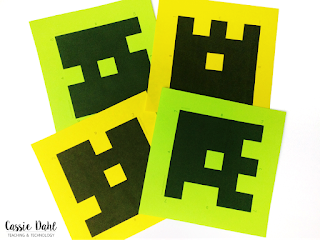 You can also print them on colored (or white) cardstock that you can use year after year. Just stay away from dark colors- the more contrast between the black code and the colored paper the better. 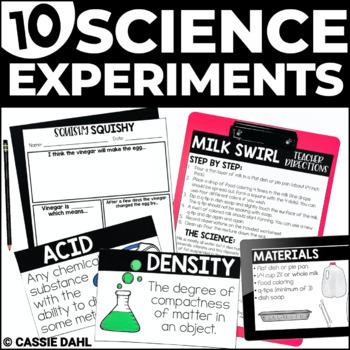 I have a set of laminated cards (matte lamination) that I have hanging in the front of my classroom. We also have a set of white (regular printer paper) that we glued into our notebooks. 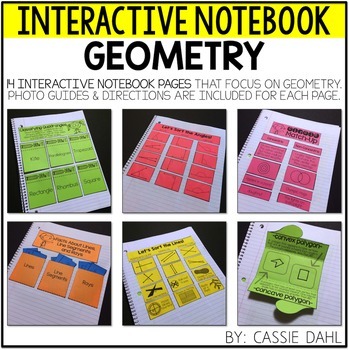 When we glued the cards in, I told the kids that it didn't matter which way A was facing- that way everyone's notebook is different. This way they are always ready for us to use and we don't have to hand them out. The questions and answers. 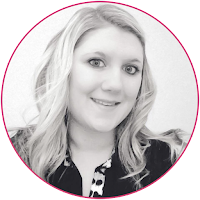 There are two options that you can do for the questions and answers. 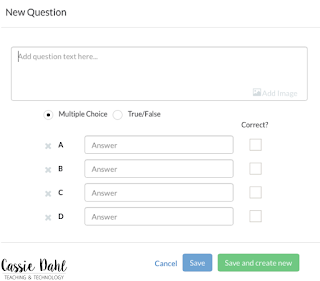 It can either be a true/false question or a multiple-choice question. 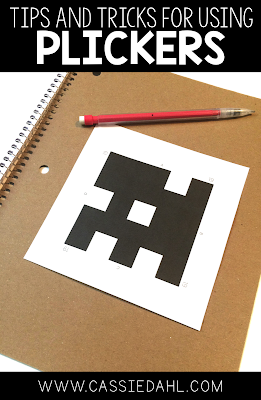 On the Plickers website, you can easily type in the questions and answers ahead of time. 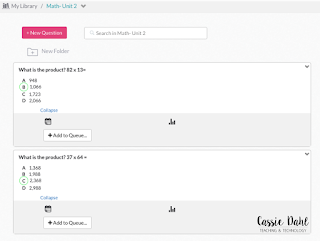 As you can see at the top of those questions there is a "my library" tab as well as a "math- unit 2" tab. 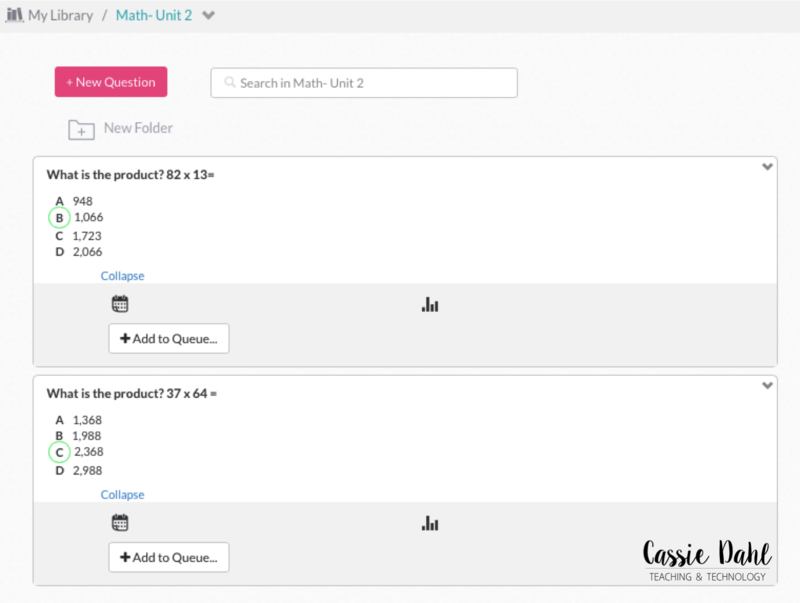 On the website you can create folders in your library of your stored questions. That way, you don't have to reinvent the wheel year after year. You can also add folders inside of folders. So maybe during Math- Unit 2, you use plickers for lesson 2, 5 and 8. 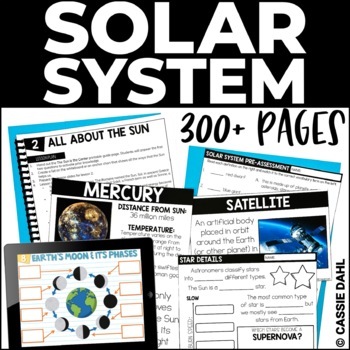 You could have a folder for those lessons (or of course the title of the lesson...). 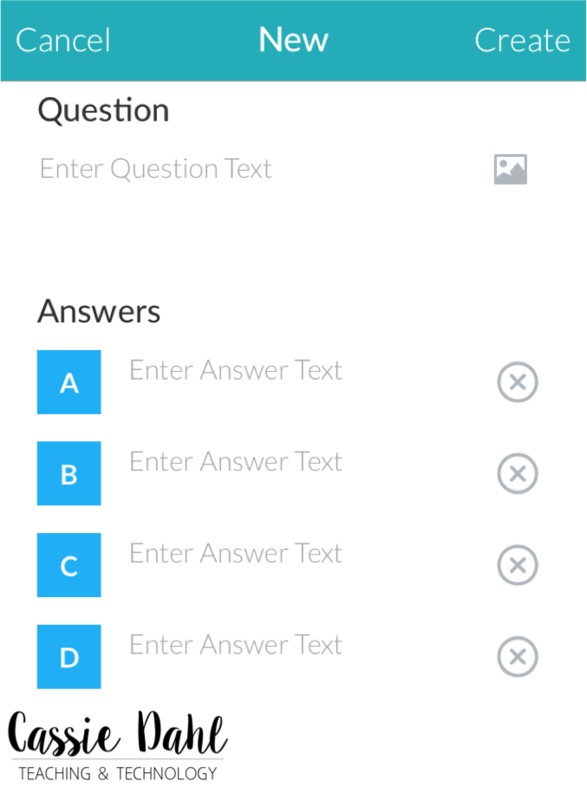 You can also add questions from your mobile device! This is slick to do at home while you are sitting on the couch and being #productive. Oh it gets even better than that! 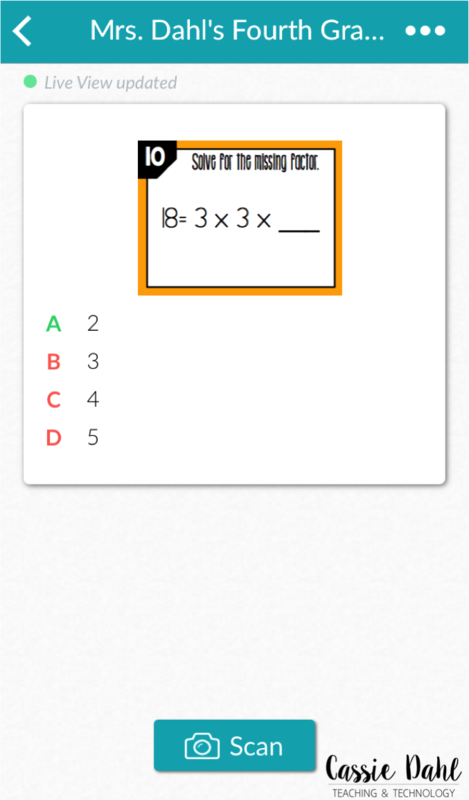 You can also add images instead of typing the questions. 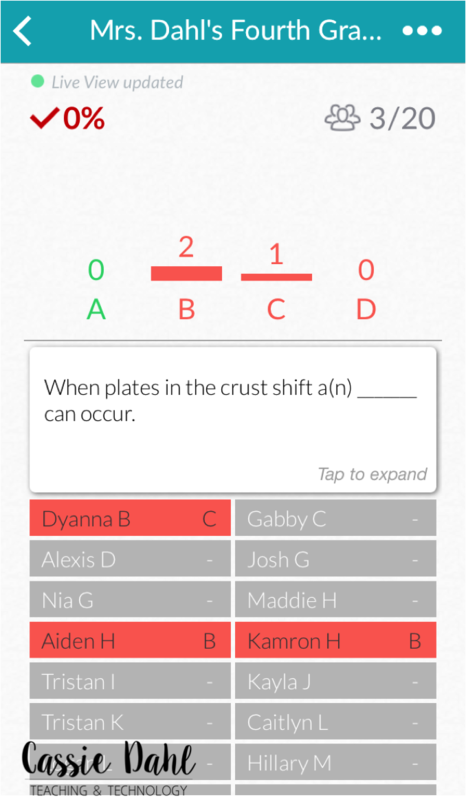 So, you could take screenshots of task cards or concepts that you can't put into words (like acute vs obtuse angles). 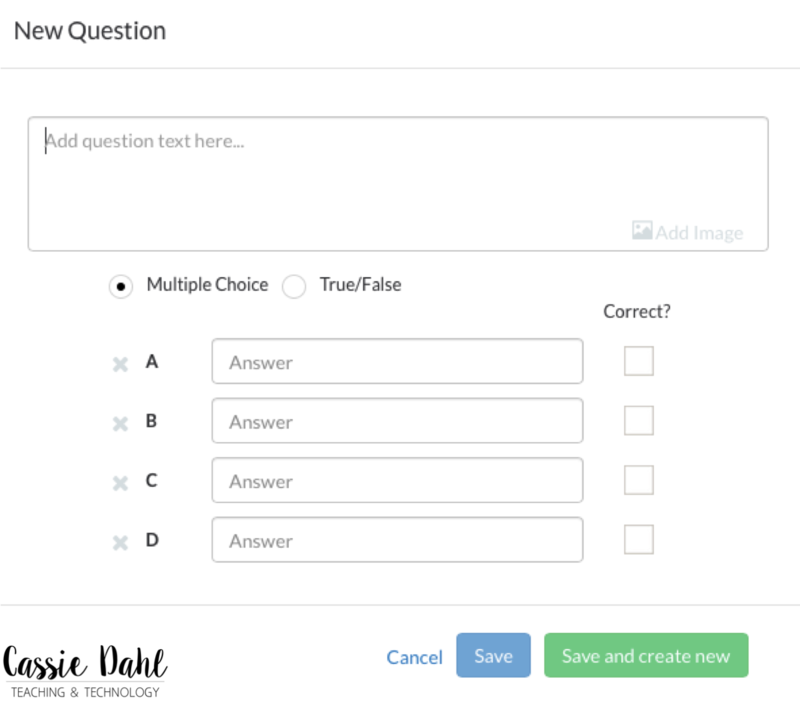 Then, just upload the screenshot as a question and select the correct answer. If the image already has multiple choices (ABCD or T/F) just select the correct answer and move on. 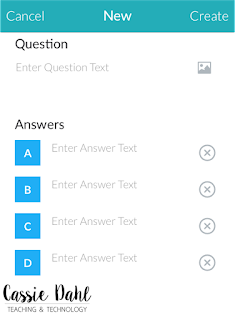 Or, you can always type in answers too! 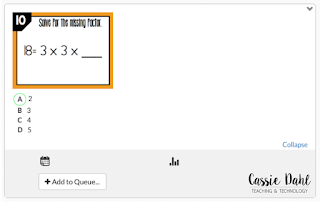 To teach your students how to use the cards, I recommend adding a few "fun questions". You can do questions like which is your favorite type of ice-cream and then add four flavors, or which color do you prefer and then do something silly like lavender, fuchsia, magenta and lilac. :) I am sure the boys would love that! 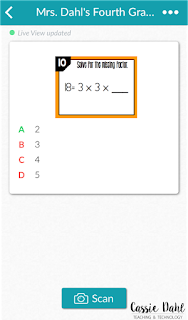 You can display the questions whole screen by "entering live mode" on a computer that displays (either to a projector or smart board). 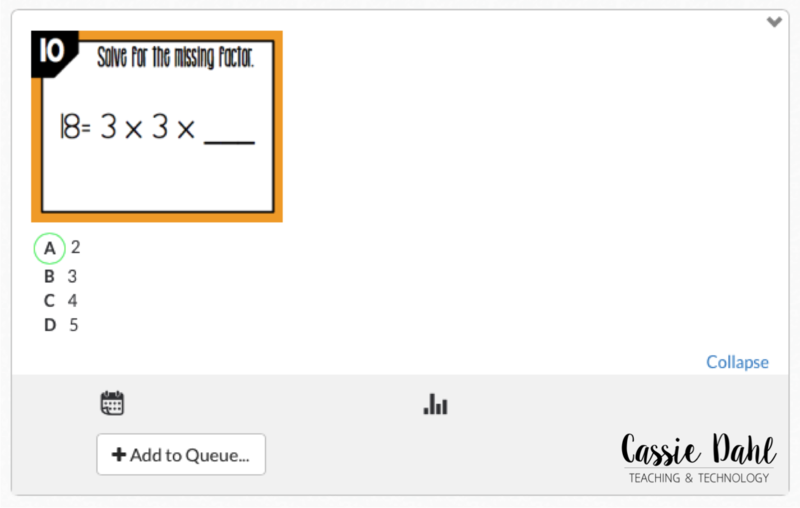 This way your students can all see the question. Don't worry- they won't see other's answers by going live. Once you have given them time to solve, say "cards up", clap three times, or give them some kind of signal to put their cards in the air. You don't want to have them put their cards up while others are working... errr cheating will happen. Then you click the "scan" button on the app and start moving your device around the room. 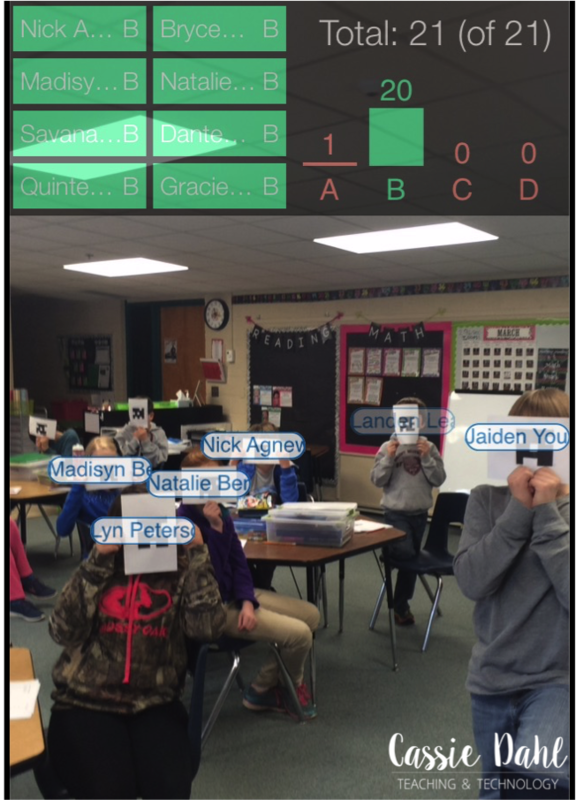 You can actually stand at the front of your classroom and it should scan all the way to the back without you having to walk back there. As you are scanning the app will flash their name in green if they are correct or red if they are incorrect. 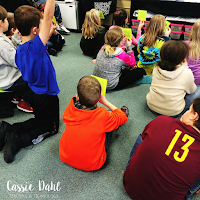 The whole classroom display will show their names in a light blue and then turn to a different color when scanned (the class will not see correct/incorrect answers). 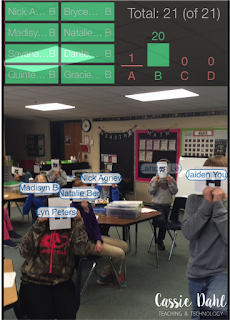 *Note: this photo is a little bit old (last year) and the app's interface has changed a little but it still has the red/green and the student's names on the screen. When you open the app to scan, this is what you will see. The question will be listed in the top area of the white box (this one happens to be that image question from above), the answers will be listed with the correct answer marked in green. To scan, simply tap the scan button and BOOM. You are in business. When you are finished scanning, click the check mark and then it will take you to the results screen. The results can be archived so you can reference them later. This is an example of three students who "chose" the wrong answer. 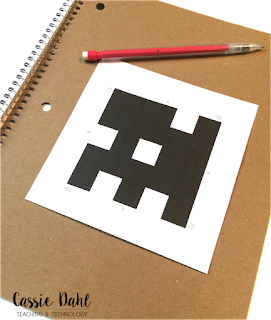 At a later time, you can log in to your Plickers account and print off score reports. 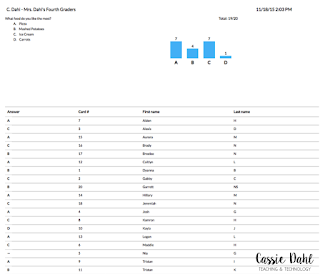 Here is a score breakdown for one of the "fun questions" when we were first practicing using the cards. 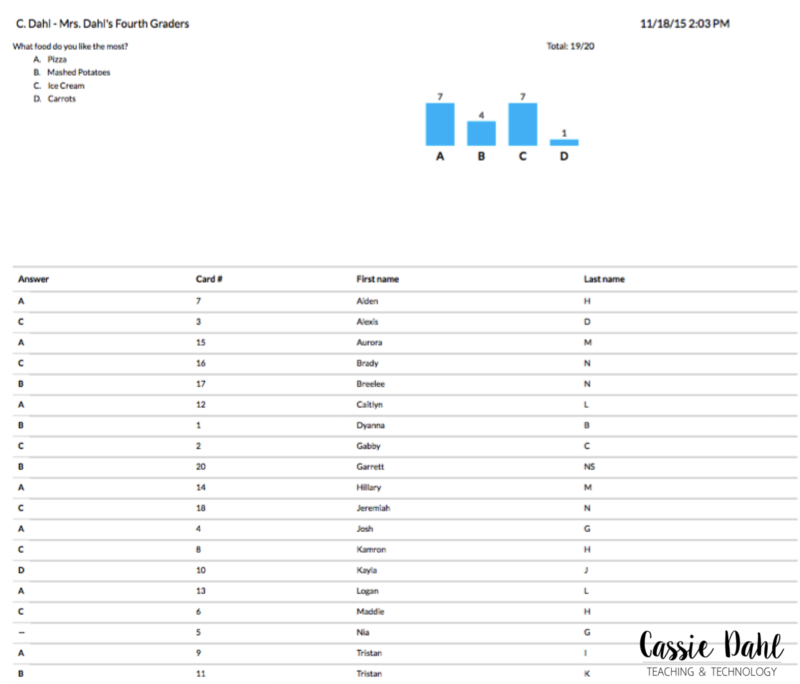 You can easily take the scores from these documents and plug them into your grade book to give your students an actual score from the assessment. The list goes on and on. 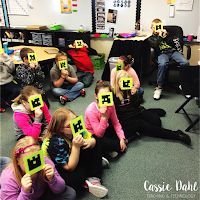 Have you used Plickers? If so, I would love to find out how it went for you! Leave me a comment o share your results. 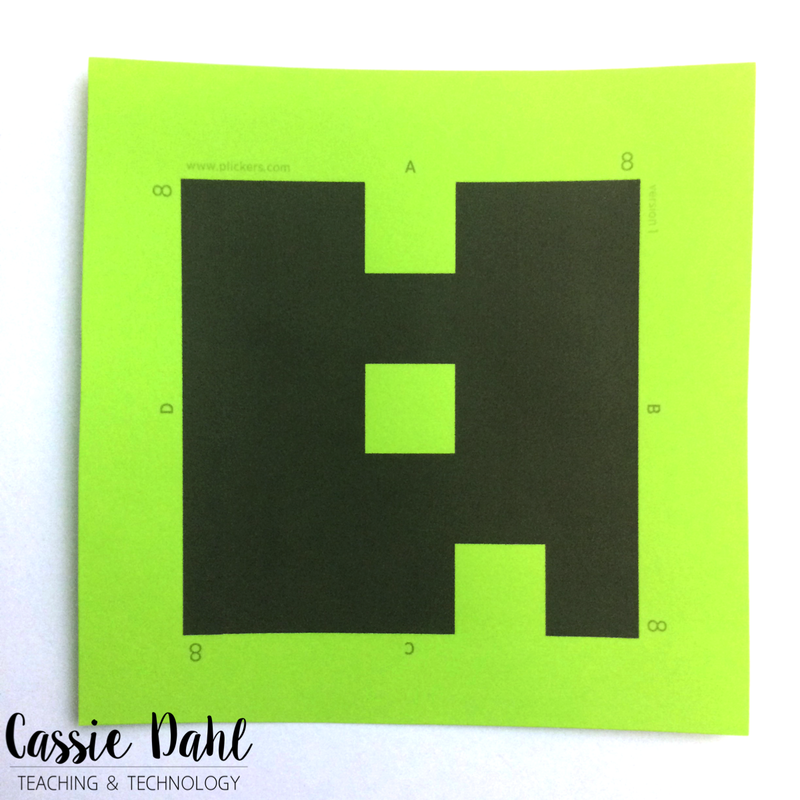 Feel free to pin one of the images below if you want to save this post for later or share it with your techy teacher friends! I've seen this around and totally want to try it! I like the idea of having the kids always have a card with them. Passing things out isn't always that fun. Thanks for sharing!